Maine Sports Media: MBR Radio and the Maine Sports Network get ready for the Playoffs! MBR Radio and the Maine Sports Network get ready for the Playoffs! After that monster game last night between McAuley and Deering, makes everyone think 1 thing..TOURNAMENT TIME! Well MBR Radio and The Maine Sports Network is lining up what will be the BEST tournament coverage in Maine..PERIOD. Let's start with Radio. 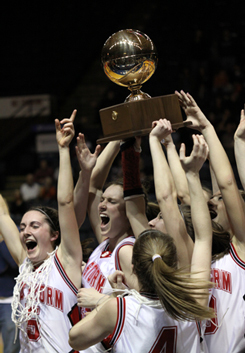 We will bring you every single Western Class A & B Girls and Boys game on the radio. We will be on air on one of 3 Atlantic Coast Radio stations...96.3 The Big Jab, AM1310 NewsTalk WLOB or 95.5 WLOB. Who will bring you the games..oh only the best voices in the state. Our play by play group is lead by multi-media superstar Michael Hoffer of The Forecaster. He will head up the A team..but here is the thing..there isn't really a B team. While Michael will be our lead voice, the other voices in our crew are as talented as it gets. Maine broadcasting legend Rob Kennedy will check in from time to time, as will WGME-TV's Evans Boston and WCSH 6's Lee Goldberg. Not too shabby huh? Tom Nolette of MBR.ORG, Jeff Schools (that's me!) and Matty Boutwell of The Maine Sports Network will provide color commentary and sideline reporting along the way. And don't forget Lenny Holmes of The Maine Hoops Basketball Club will be popping in to provide in game analysis of the x's and o's of the chess match being played by coaches. We are going to work VERY hard bringing you the quality broadcast you have come to expect from our little group. That isn't all, we will bring you high quality, in game photography to capture the excitement that is Maine High School Basketball! We have a stable of photographers at the ready to grab those precious moments in all the kids lives. Still not done...we are preparing the best social media coverage of any event in Maine Sports history. Kevin Daly of Daly Digital Media and member of The Maine Sports Network, will lead a group of people that will keep things updated and up to the minute on Twitter, Facebook, all of our blogs and things we haven't thought of yet, Kevin and our team will DELIVER! We are so looking forward to tournament time, this is why we all do this! The excitement, the atmosphere is as exciting as it gets and we will help bring it to those that can't be there. Please keep checking MBR Radio.com and The Maine Sports Network.com for all the updates and details of what we will be bringing starting February 15th.